Your smile is something that reflects your personality, your drive, and your soul. Feeling comfortable in your smile is as important as choosing what you wear each day. You want your smile to be something that you don’t have to hold back, and will make you someone who is fun and enjoyable to be around. Everyone wants a beautiful smile, and our custom-designed porcelain veneers can give you a Hollywood smile, just like the ones you see on the latest magazine covers. Porcelain veneers can be any size, shape, and color…it’s all up to your personal preference! They’re useful for transforming smiles with crooked, gapped, chipped, or discolored teeth. The end result is a straight, white smile that is a dream come true! 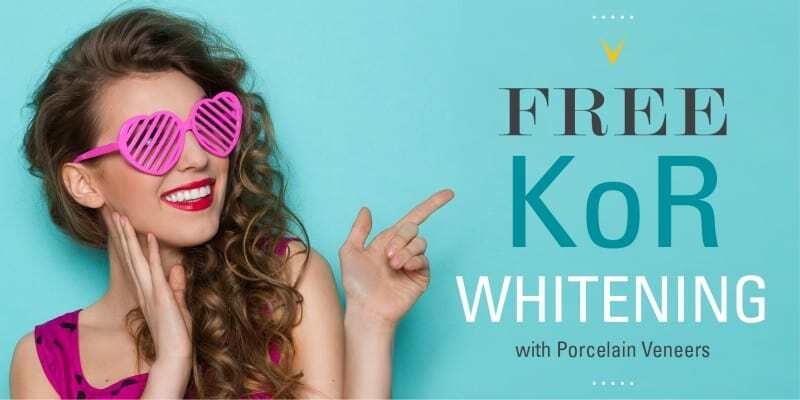 Ask about our FREE KoR Whitening with Porcelain Veneers! Not everyone desires the commitment of full porcelain veneers. Because of this, we offer minimal prep veneers. These veneers are slightly translucent and offer a more straightforward approach to your smile makeover. While there are fewer shape and color options, minimal prep veneers require less tooth preparation and still produce a dramatic overall effect. Your smile is more than just one or two teeth…it’s a unique feature that truly affects your way of life. If you have had a history of bad teeth, aging restorations, or just want to change out your old metal fillings, Dr. Sheri can help. Together, we’ll work with you to create an action plan that not only improves your smile’s appearance; it also strengthens the function of your teeth. Bulky gum tissue can make teeth look shorter than they actually are. It can also get in the way when restorative or aesthetic treatments like veneers or porcelain crowns are needed. Since she wants every smile to live up to its full potential, Dr. Sheri partners with a periodontist to perform crown lengthening on a tooth-by-tooth basis as needed. Perhaps you’re happy with the overall appearance of your smile, but there are one of two areas that you just need to address. Composite bonding is perfect for covering small irregularities, closing gaps between the teeth, or correcting chipped tooth edges. The material is color-matched to your natural enamel, so no one will be able to tell that it’s even there! We only choose the best for our patients– and that includes the KöR Whitening system! So gentle, so effective, it was judged by a respected medical journal to be the most reliable way to whiten your teeth – permanently! Ask About Whitening For Life! Tooth whitening is perfect for beautiful smiles that have soaked up tea, coffee, or red wine stains through the years. We also recommend whitening prior to other types of cosmetic procedures, for the best results. That’s why we offer a fabulous “Whitening for Life” program. All you have to do is keep your regular hygiene visits and your smile will be brightened and stay that way for years, all while keeping your mouth as healthy as can be!